This is the latest in NDP's Weekday Lunch series, your one and only source into the scandalous lives of my tupperware. For earlier Weekday Lunch posts, check this out. I'm a big fan of kale salads. They're a pop of green in a season where not much is; they basically never wilt; and given how healthy they are, it's hard not to feel righteous eating one. My usual kale salad combines lacinato kale - the long, bumpy leaves that are almost glamorous in texture, also known as dinosaur kale - with pine nuts, raisins or currants, and shards of Parmigiano Reggiano cheese. It's the sort of salad that's good now, better later. My friend (and author of various guest posts on NDP) Jeremy pointed out that over time, as the kale wilts, it takes on a texture almost like seaweed, which is quite pleasant. Last week, in the mood for kale salad, I opened the fridge to find I was fresh out of lacinato. I did have a bunch of regular curly-leaf kale, but I knew it would take a thicker, more serious dressing to tame those wiry leaves. Where did I turn? The humble avocado. Avocado dressings are flat-out underrated. People talk of yogurt, of mayonnaise (the enemy of delicious - I can't stand the stuff), of buttermilk, but never of avocado. It's too bad: avocados are smooth and buttery, thick enough to make a beautifully emulsified dressing, and did I mention they're delicious? For this salad, I combined kale with those crunchy, juicy asian pears that I can't seem to get enough of. I added scallions for texture and bite, then dressed the mess with a dressing of soy, rice wine vinegar, and avocado, whipped into submission with the help of grapeseed and sesame oils. And now, I warn you: people, the combination is addictive. I really can't get enough. I've made this dressing three or four times over the past few weeks, tweaking it ever so slightly to get that perfect zestiness. I've eaten it on regular kale, on lacinato kale once I replenished my supply, and even used it as a dip for slices of asian pear as an afternoon snack. It's ridiculously good. Hope you like it as much as I do. Rip the kale into medium sized pieces and place in a large bowl. Add sliced scallions and pear. Scoop the avocado into a medium bowl and use a fork to mash it until totally smooth. Add all the remaining ingredients except the grapeseed oil and stir to combine. Then gradually add the grapeseed oil and whisk until fully combined. If necessary, add water by the tablespoon until dressing is thin enough to pour. 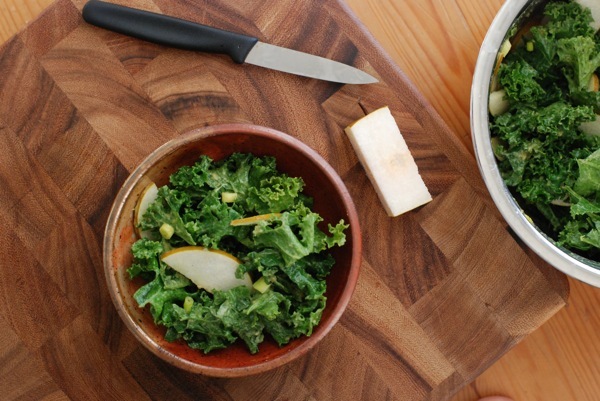 Add dressing to kale salad. Start with half, toss, and add more dressing if necessary. Allow the salad to sit for at least 10 minutes before serving. Salad will keep up to 1 day dressed; dressing will keep up to 1 week in the refrigerator.